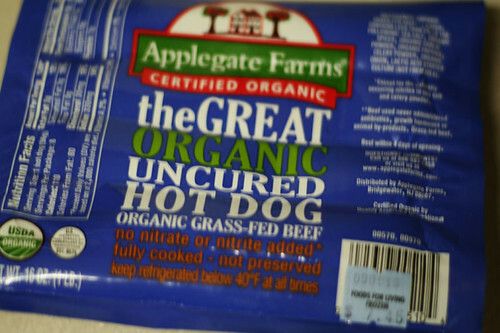 A few weeks ago, I picked up a package of Applegate Farms “The Great Organic Uncured Hot Dog”, which uses beef from grass-fed cows. A package of 8 set me back nearly $7.50, which is WAY more than you will pay for commodity hot dogs at the grocery store. In fact, it was the most expensive price I’ve ever paid on a per-hot-dog basis outside of sporting events. 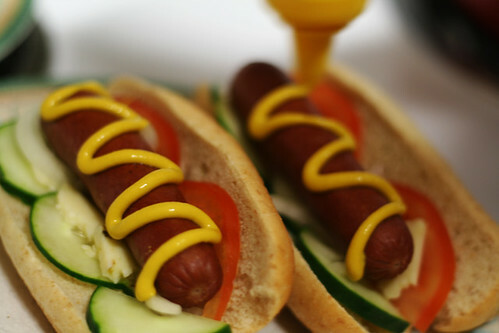 A Chicago-style, or “salad dog”, is a mixture of vegetables that have a minimizing effect on the hot dog itself. Typically you would expect to see cucumber, tomato, onion, roasted pepper, and pickle relish (at minimum). In this preparation I restricted myself to the first three items. It was FANTASTIC, even with the bun falling slightly apart. 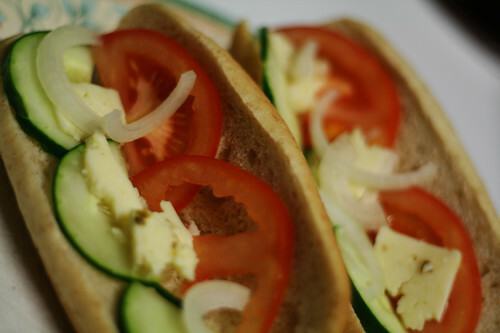 Certainly some of the taste can be attributed to the hot dog itself, but beyond that the mix of cucumber, pepper jack cheese, and tomato fit in very well. Thaw the hot dogs (if frozen). Place hot dogs in boiling water, allow it to continue boiling 4-5 minutes (hot dogs should reach an internal temperature of 170 degrees F). Prepare ingredients while hot dogs are boiling. This really just amounts to cutting a few vegetables and is very quick. Turn heat off, allow it to cool. Fashion the ingredients like you see in the pictures. Mix it up if you are in the mood. Consider adding pickle relish as well. Serve with whatever you like, perhaps baked beans and potato chips.